Transcatheter aortic valve replacement (TAVI) is an alternative treatment for patients with symptomatic severe aortic stenosis ineligible for surgical aortic valve replacement (SAVR) or at increased perioperative risk. Due to continually emerging evidence, we performed a systematic review and meta-analysis comparing benefits and harms of TAVI, SAVR, medical therapy, and balloon aortic valvuloplasty. We searched MEDLINE, Embase, and Cochrane CENTRAL from 2002 to June 6, 2017. We dually screened abstracts and full-text articles for randomized controlled trials (RCTs) and propensity score-matched observational studies. Two investigators independently rated the risk of bias of included studies and determined the certainty of evidence using GRADE (Grading of Recommendations Assessment, Development and Evaluation). If data permitted, we performed meta-analyses using random- and fixed-effects models. Out of 7755 citations, we included six RCTs (5862 patients) and 13 observational studies (6376 patients). In meta-analyses, patients treated with SAVR or TAVI had similar risks for mortality at 30 days (relative risk [RR] 1.05; 95% confidence interval [CI] 0.82 to 1.33) and 1 year (RR 1.02; 95% CI 0.93 to 1.13). TAVI had significantly lower risks for major bleeding but increased risks for major vascular complications, moderate or severe paravalvular aortic regurgitation, and new pacemaker implantation compared to SAVR. Comparing TAVI to medical therapy, mortality did not differ at 30 days but was significantly reduced at 1 year (RR 0.51; 95% CI 0.34 to 0.77). Given similar mortality risks but different patterns of adverse events, the choice between TAVI and SAVR remains an individual one. The prevalence of severe aortic stenosis (AS) increases with age to a value of 3.4% in people 75 years or older. Approximately one million elderly patients in the European countries and 540,000 in North America suffer from symptomatic severe aortic stenosis. These numbers are expected to increase due to demographic changes . Since severe symptomatic AS is associated with increased mortality, prognosis without treatment is poor . While in the past, surgical aortic valve replacement (SAVR) has been the only recommended treatment of choice in patients with symptomatic severe AS, transcatheter aortic valve replacement (TAVI) has emerged as an alternative treatment option over the last 15 years . Today, the European Society of Cardiology (ESC) guidelines recommend TAVI in patients with severe symptomatic AS who are considered inoperable . These recommendations are mainly based on one randomized controlled trial (RCT), the Placement of Aortic Transcatheter Valves (PARTNER) trial arm B , where TAVI was compared to medical therapy in patients who were considered inoperable . In regard to patients who are deemed operable but at increased surgical risk, the decision between TAVI and SAVR should be made according to assessment of the interdisciplinary Heart Team, based on individual risk factors, and patient characteristics . With the ongoing uptake of TAVI worldwide, the amount of published data is constantly increasing. In addition to initial clinical trials in high-risk patients [5–7], recent RCTs for intermediate-risk patient populations have been published [8, 9] showing non-inferiority regarding a composite endpoint of all-cause death or disabling stroke for TAVI as compared to SAVR. Supplementary to data from RCTs comparing TAVI with SAVR, non-randomized trials and observational studies are adding further information. 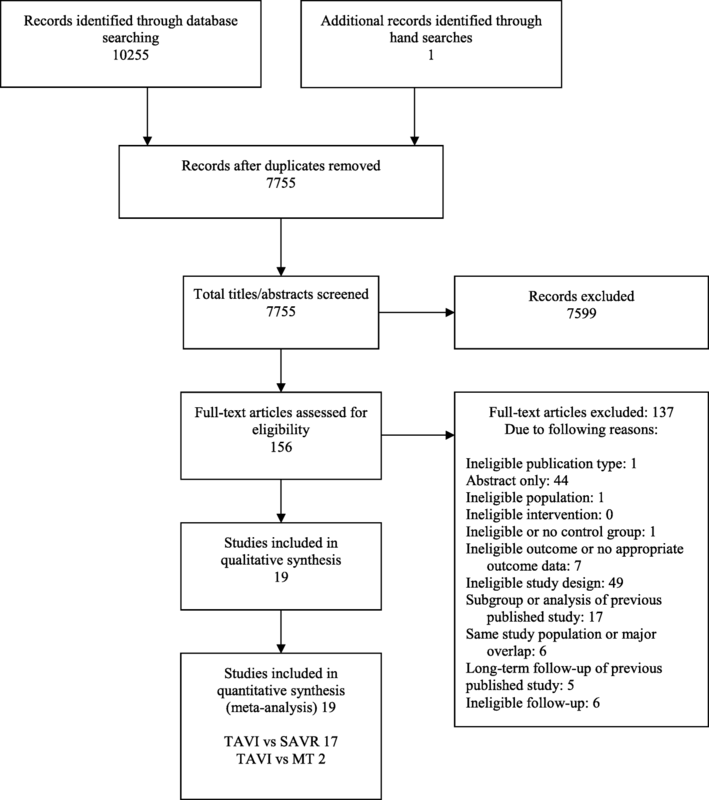 Prior systematic reviews in the field do not cover all recently published trials comparing TAVI to SAVR [10–12]. Therefore, the aim of this systematic review is to summarize the efficacy, effectiveness, and safety of TAVI in patients with symptomatic severe aortic stenosis compared to SAVR and non-surgical management comprising balloon aortic valvuloplasty (BAV) and medical therapy. We adhered to the Preferred Reporting Items for Systematic Reviews and Meta-analyses (PRISMA)  statement throughout this manuscript (PRISMA checklist see Additional file 1). An experienced medical information specialist (BW) searched the electronic databases MEDLINE, Embase, and the Cochrane Central Register of Controlled Trials via Ovid on January 27, 2017, with an additional update performed on June 6, 2017. In the literature search, we went back in time up to January 2002, when TAVI was performed for the first time. As search terms, we used free-text terms and Medical Subject Headings (MeSH) in order to identify relevant references. The search strategy for each database used is provided in Additional file 2. In addition, we searched ClinicalTrials.gov to detect unpublished studies. In order to identify publications not found by searches in electronic databases, we checked reference lists of included articles and relevant reviews and manually searched websites of selected cardiovascular journals. All studies comparing TAVI for the treatment of severe symptomatic aortic valve stenosis to other treatment strategies including SAVR, BAV, and medical therapy were eligible. We present study eligibility criteria in detail in Table 1. We included efficacy, effectiveness, and safety outcome reported as in-hospital, perioperative, or postoperative. We excluded case reports, case series, and any study without control group and fewer than 100 patients in the TAVI arm. We excluded publications not reporting primary data (narrative reviews, systematic reviews, and meta-analysis) as well as abstracts only, letters, and editorials. Two reviewers (DM, GW) performed an independent initial screening of citations by title and abstract. If predefined study eligibility criteria were met or the abstract was inconclusive, full-text was obtained and assessed for relevance. Each step of the study selection process was pilot tested. Disagreements between reviewers were solved by consensus or by involvement of a third reviewer. In case a study was published in multiple publications, the most comprehensive publication was included. An electronic data abstraction form was used to obtain study and procedural characteristics, baseline characteristics of the patient population, and outcome parameters of interest. A second reviewer checked extracted data for accuracy and completeness. In case of uncertainty or inconsistency of published data as well as a potential overlap of study populations from different publications, we contacted the corresponding authors via e-mail for clarification. In the absence of reported intention-to-treat analyses, data from per-protocol or as-treated analyses were extracted and indicated in a footnote. Two reviewers assessed the risk of bias (HA, GW) of included studies. For risk of bias assessment of RCTs, we used the Cochrane risk of bias tool  and the Newcastle-Ottawa Scale (NOS) for observational studies . The Grading of Recommendations Assessment, Development and Evaluation (GRADE) approach was applied to assess the certainty of evidence (very low, low, moderate, high) . For 30-day and 1-year mortality, we calculated relative risk with 95% confidence intervals (CI). Fixed-effects (Mantel-Haenszel method)  and random-effects meta-analyses (DerSimonian and Laird method)  of relative risk estimates were employed. Since we anticipated clinical heterogeneity across studies, we reported results only from random-effects models in the text; forest plots also depict results from fixed-effects models. We conducted subgroup analysis for different study types and risk populations. Heterogeneity across trials was assessed by visual inspection of the forest plots and calculation of I2 statistics [19, 20]. We assessed potential publication bias with Egger’s tests and the visual interpretation of funnel plots. We used Stata 14.2 (Stata Corp, College Station, TX, USA) for all statistical analyses. A p value of < 0.05 was considered statistically significant. After removal of duplicates, 7755 citations were screened by title and abstract. Subsequent full-text review included 19 studies with a total of 12,238 patients. Details of the study selection process are shown in the PRISMA flowchart (Fig. 1), and list of excluded full-text articles is provided in Additional file 2. Among the included six RCTs (5862 patients), five compared TAVI with SAVR [5, 7–9, 21], and one TAVI with medical therapy/BAV . Furthermore, we included 13 observational propensity score-matched studies (6376 patients), of those 12 studies compared TAVI with SAVR [22–33] and one TAVI with medical therapy/BAV . Based on our inclusion criteria, we did not identify any study comparing TAVI to BAV or medical therapy only. The shortest follow-up period was 1 month [22, 33], whereas the longest was 5 years . Most of the studies were conducted as multicenter studies [4, 5, 7–9, 21–24, 26, 28, 29]. Valve Academic Research Consortium (VARC), VARC-2, or VARC-like definitions were applied in several studies for all or certain clinical endpoints [4, 5, 7–9, 21–23, 27, 30, 31, 33]. Because of varying study durations and endpoints, the number of included studies in the respective meta-analyses varied. Among the 19 selected studies, all six RCTs and 12 observational propensity score-matched studies were rated low risk of bias. Only one observational propensity score-matched study was rated as moderate risk of bias . Detailed risk of bias assessments for all included studies are presented in Additional file 3. Mean age of study participants ranged from 74 to 85 years. The majority of studies included patients who were considered as high risk for surgery [4, 5, 7, 22–26, 32, 34]. However, recently published RCTs [8, 9, 21] and a few propensity score-matched observational studies [27–31, 33] investigated TAVI in intermediate- and low-risk patient populations. This is reflected by lower baseline risk scores (The European System for Cardiac Operative Risk Evaluation [euroSCORE] and the Society of Thoracic Surgeons [STS] score) of patients enrolled in those trials. Overall, the majority of study participants reported New York Heart Association (NYHA) class III or IV at baseline. The mean left ventricular ejection fraction (LVEF) was greater than 50% in all included studies reporting LVEF. Although co-morbidities varied across studies, the prevalence was high in general. The percentage of patients with an implanted permanent pacemaker was more than 20% in three studies [4, 5, 7] and considerably lower or not reported in remaining studies [8, 9, 21–34] (Table A in Additional file 4). One study investigated only patients on dialysis . Results of each individual study comparing TAVI with SAVR or medical therapy/BAV are summarized in Table B in Additional file 4. In the included studies, both balloon-expanding (Edwards SAPIEN® and SAPIEN XT®) and/or self-expanding TAVI devices (Medtronic CoreValve® and Evolut R®, Symetis ACURATE®) were evaluated. Different access approaches were performed in most of the studies. Overall, the most common vascular access was transfemoral followed by transapical and other accesses such as transsubclavian or transaortic. In total, six studies exclusively applied one percutaneous approach for valve implantation (transfemoral [4, 27, 31], transapical [23, 25, 32]). Five out of six RCTs were funded by valve manufactures [4, 5, 7–9]. Detailed study characteristics are shown in Table 2. Random-effects meta-analysis of 17 studies with a total number of 11,610 patients (5 RCTs, 12 propensity-matched studies) revealed no significant difference in 30-day mortality between TAVI and SAVR (4.4% versus 4.2%; RR 1.05; 95% CI 0.82 to 1.33; I2 = 39.8%; Fig. 2). Likewise, in subgroup analysis of RCTs (3.1% versus 3.5%; RR 0.87; 95% CI 0.61 to 1.23; I2 = 21.8%) and propensity score-matched observational studies (5.7% versus 4.9%; RR 1.16; 95% CI 0.85 to 1.58; I2 = 43.4%), no statistically significant difference could be noted. Regarding 1-year mortality, no significant difference was seen between TAVI and SAVR in a meta-analysis of 13 studies with a total number of 10,040 patients (5 RCTs, 8 propensity score-matched studies, 13.4% versus 13.1%; RR 1.02; 95% CI 0.93 to 1.13; I2 = 1.4%; Fig. 3). Both random-effects meta-analysis of RCTs (11.9% versus 12.8%; RR 0.93; 95% CI 0.81 to 1.07; I2 = 0%) and propensity score-matched observational studies (15.3% versus 13.5%; 1.13; 95% CI 0.98 to 1.30; I2 = 0%) showed no statistical significant difference between TAVI and SAVR. No statistically significant differences between RCTs and propensity score-matched studies could be identified. Heterogeneity was moderate for 30-day (I2 = 39.8%) and negligible for 1-year mortality (I2 = 1.4%) (Figs. 2 and 3). Egger’s test and visual inspection of funnel plots did not suggest publication bias (see Additional file 5). Summary of findings tables with certainty of evidence rating is presented in Additional file 6. Subgroup analysis of RCTs and propensity score-matched observational studies with high-risk patient populations yields similar all-cause mortality after TAVI and SAVR at 30 days (5.4% versus 5.7%; RR 0.92; 95% CI 0.65 to 1.31; I2 = 37.0%) and 1 year (18.5% versus 18.1%; RR 1.04; 95% CI 0.85 to 1.27; I2 = 44.1%). Random-effects meta-analysis of studies with intermediate- or lower-risk patients yields no statistically significant difference of those treated with TAVI compared to SAVR at 30 days (3.9% versus 3.5%; RR 1.17; 95% CI 0.84 to 1.63; I2 = 40.5%) and 1 year (11.1% versus 10.8%; RR 1.03; 95% CI 0.90 to 1.18; I2 = 0%) (Additional file 7). Only two studies (1 RCT, 1 propensity score-matched study) with a total of 628 patients compared TAVI with medical therapy, including 9.6%  and 83.8%  of patients with BAV in the medical therapy arm, respectively. A numerical trend for higher 30-day mortality with TAVI compared with medical therapy did not reach statistical significance, neither in the individual studies nor in random-effects meta-analysis (8.0% versus 4.8%; RR 1.66; 95% CI 0.90 to 3.08; I2 = 0%). In contrast, 1-year mortality was significantly reduced after TAVI (26.4% versus 50.3%; RR 0.51; 95% CI 0.34 to 0.77; I2 = 70%). A random-effects meta-analysis (15 studies, 9990 patients) yielded no statistically significant difference for risk of stroke at 30 days for patients treated with TAVI compared to SAVR (3.1% versus 3.6%; RR 0.84; 95% CI 0.64 to 1.10; I2 = 17.6%). Risk of stroke at 1 year was similar for patients treated with TAVI and SAVR (7 studies, 7035 patients, 6.3% versus 6.5%; RR 0.96; 95% CI 0.75 to 1.23; I2 = 34.8%). Major bleeding at 30 days was statistically significantly lower for patients who underwent TAVI compared to SAVR, based on a random-effects meta-analysis (9 studies, 7198 patients, 13.0% versus 24.6%; RR 0.55; 95% CI 0.34 to 0.88; I2 = 94.2%). Based on a random-effects meta-analysis (10 studies, 8354 patients), risk of major vascular complications at 30 days was statistically significantly higher for patients treated with TAVI than with SAVR (7.8% versus 1.9%; RR 6.35; 95% CI 3.03 to 13.29; I2 = 79.6%). In addition, risk of moderate or severe paravalvular aortic regurgitation (8 studies, 6946 patients, 6.4% versus 0.9%; RR 6.86; 95% CI 4.71 to 9.99; I2 = 0%) and new pacemaker implantation (14 studies, 9790 patients, 14.4% versus 5.5%; RR 2.43; 95% CI 1.62 to 3.63; I2 = 84.0%) was statistically significantly higher for patients who underwent TAVI compared to SAVR. >A random-effects meta-analysis yielded no statistically significant differences for risk of transient ischemic attack (TIA) (8 studies, 6492 patients, 1.0% versus 0.8%; RR 1.20; 95% CI 0.66 to 2.18; I2 = 12.6%) and myocardial infarction at 30 days (12 studies, 8844 patients, 0.9% versus 1.1%; RR 0.78; 95% CI 0.51 to 1.20; I2 = 0%). Results from meta-analysis for safety endpoints are presented in Fig. 4, and individual forest plots are provided in Additional file 8. We provide rates of adverse events as well as endpoint definitions in individual studies in Additional file 4. In the multicenter RCT , the risk of stroke at 30 days was statistically significantly higher for patients treated with TAVI than medical therapy (6.7% versus 1.7%; RR 4.0; 95% CI 1.15 to 13.93). At 30 days, TAVI statistically significantly increased the risk of major bleeding, vascular complications, and moderate or severe paravalvular regurgitation. Within 30 days in this trial, no TIA and myocardial infarction occurred, neither in the TAVI nor the medical therapy group (Additional file 4). TAVI has emerged as a promising alternative to SAVR, and increasing numbers of interventions are performed worldwide. 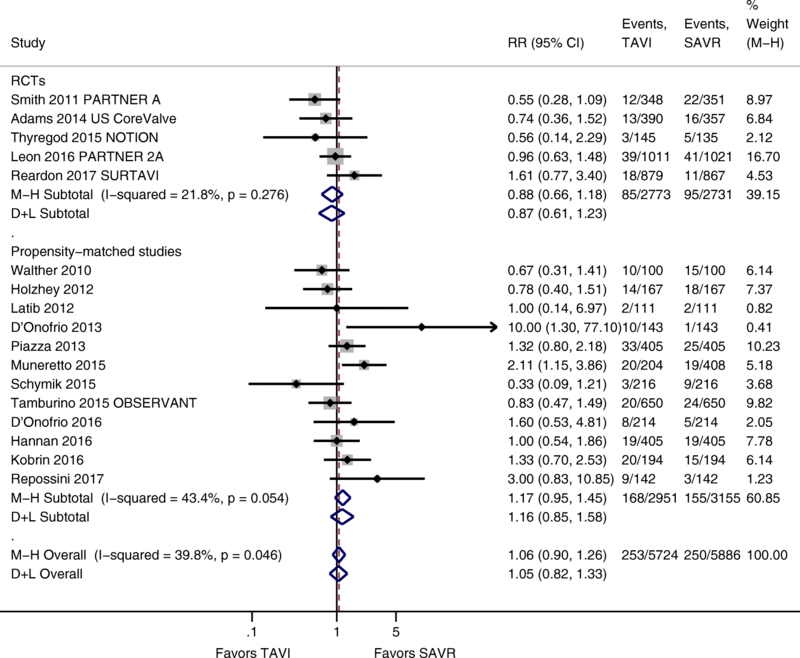 This up-to-date systematic review and meta-analysis exhibited reassuring results for both methods as no difference was found with respect to all-cause mortality between TAVI and SAVR, both at 30 days and 1 year. Our results of comparable mortality between TAVI and SAVR at 30 days corroborate findings of other meta-analyses [10, 11, 35–37]. Similarly, the lack of difference in 1-year mortality between TAVI and SAVR is also consistent with results from previously published reviews [10, 36]. In order to gain information outside RCTs, we also included real-world observational data. While such studies can help to consolidate the evidence of an increasingly implemented intervention like TAVI, they are highly susceptible to bias and confounding. Thus, we limited these data to propensity score-matched studies of moderate size including at least 100 patients in the TAVI group. The amount of evidence investigating the efficacy and safety of TAVI is constantly increasing. Importantly, this analysis also included recent trials such as PARTNER 2A  and SURTAVI , in which patients considered of intermediate perioperative risk have been included, reflecting the increasing use of TAVI not only in high-risk populations. While the less invasive nature of TAVI seems attractive, this comes at the price of higher numbers of adverse events, which are specifically related to the interventional nature of the procedure, such as major vascular complications, relevant paravalvular aortic regurgitation, and new pacemaker implantation. Further enhancement of implantation technique, operator skills, and valve prosthesis might reduce these events, but appropriate patient screening and selection will remain one of the most important factors. Due to the limitations of current risk scores in the setting of TAVI, additional interdisciplinary clinical judgment will continue to be crucial . 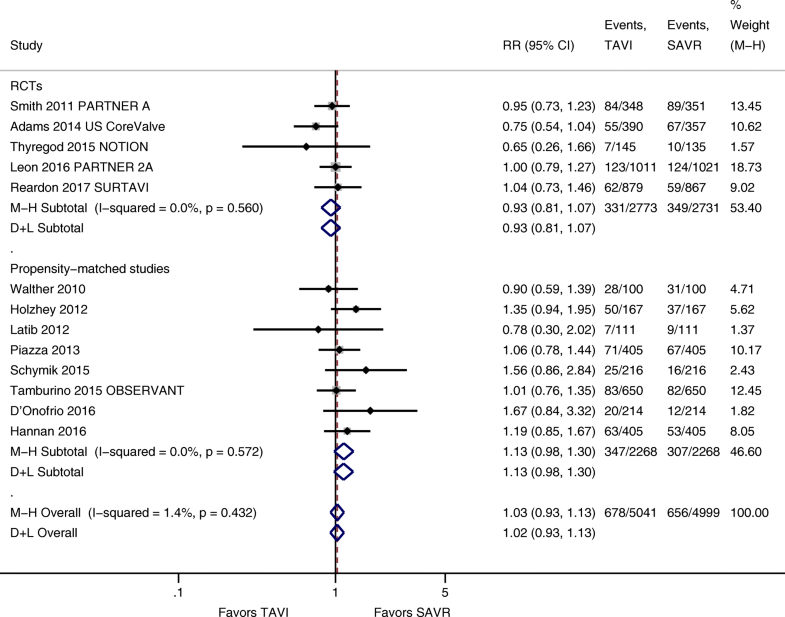 Importantly, SAVR was associated with more major bleeding than TAVI in this meta-analysis. However, as different bleeding classifications were used throughout the literature and standardized event adjudication is typically limited or absent in cohort studies, the extent of this difference is difficult to appraise and translate into individual patient information in clinical routine. Importantly, rates of cerebrovascular events and myocardial infarction were similar for both procedures, indicating no increased number of coronary events with open-heart surgery. Results from ongoing head-to-head comparisons of different TAVI approaches as well as long-term data on valve performance in large patient populations are needed to further clarify the value of TAVI for clinical routine. We observed considerable heterogeneity (I2 > 50%) for major bleeding, major vascular complications, and new pacemaker implantation at 30 days. Application of different endpoint definitions (VARC, VARC-2, or others) might explain heterogeneity for bleeding and vascular complications. Different valve devices and generations for TAVI and SAVR contribute to heterogeneity regarding new pacemaker implantations due to different risks for impairment of the conducting system of the heart. The higher mortality after 30 days is probably due to the invasive nature of TAVI compared with medical therapy, but then, there is a long-term benefit. TAVI reduces mortality at 1 year. Importantly, a relevant percentage of patients in the medical therapy groups also underwent BAV. Thus, this result underlines the current recommendation of the ESC guidelines on the management of valvular heart disease that BAV could be an option as a bridge to SAVR or TAVI in patients who are hemodynamically unstable or requiring urgent non-cardiac surgery . Guidelines recommend the decision between TAVI and SAVR to be made by the Heart Team [3, 39]. Beyond risk scores associated with outcome data like mortality, the members of the Heart Team have to consider individual patient characteristics including frailty, impaired mobility, aortic sclerosis, chest deformation, and previous chest radiation, as well as comorbidities requiring additional interventions like mitral or tricuspid valve disease, coronary artery disease, and ascending aortic aneurysm . Despite the variety of comorbidities complicating the decision for the best procedure, ongoing research has a strong focus on patients with low surgical risk or patients with moderate aortic stenosis and reduced left ventricular function in order to extend the indication for TAVI. The following limitations of our systematic review have to be considered. First, despite propensity matching and similar baseline characteristics in the compared treatment groups, residual confounding might have been present in eligible observational studies. In particular, a certain degree of subjectivity remains in the decision of the Heart Team for or against performing a TAVI in an individual patient resulting from the nature of consensus opinions. Second, different patients’ risk profiles, valve devices, implantation techniques, and endpoint definitions might have contributed to heterogeneity. Third, a methodological limitation of this systematic review is the restriction to English and German publications. Finally, we have not registered or review in PROSPERO (International prospective register of systematic reviews). Like other systematic reviews, publication bias and selective outcome reporting are other potential limitations. This systematic review and meta-analysis summarizes the most recent evidence in the enhancing field of catheter-based treatment strategies for patients with symptomatic severe aortic stenosis. One-year mortality after TAVI was not significantly different than with SAVR but lower than with medical therapy. Considering that SAVR can be performed with acceptable clinical outcome even in high-surgical-risk patients with advanced age and comorbidities [41, 42], the decision between TAVI and SAVR currently remains an individual one in most patients. Beyond short- and long-term mortality, the Heart Team has to consider patients’ preferences, clinical characteristics, anatomical and technical aspects, and cardiac conditions requiring concomitant interventions for an informed decision on choice of treatment. This project was partially supported by Institute for Research of Ischaemic Cardiac Disease and Rhythmology, Karl Landsteiner Society, St. Poelten, Austria. GW wrote the first draft of the manuscript, conducted literature screening, data extraction, and quality assessment as well as statistical analysis. BW developed the search strategy, conducted electronic literature searches, and critically revised the manuscript. DM performed the literature screening and data extraction, contributed to interpretation of data, and critically revised the manuscript. SST contributed to interpretation of data and critically revised the manuscript. HA performed data extraction, quality assessment, and critically revised the manuscript. GG contributed to interpretation of data and critically revised the manuscript. HM supervised the project and critically revised the manuscript. All authors read and approved the final manuscript. Mack MJ, Leon MB, Smith CR, Miller DC, Moses JW, Tuzcu EM, Webb JG, Douglas PS, Anderson WN, Blackstone EH, et al. 5-year outcomes of transcatheter aortic valve replacement or surgical aortic valve replacement for high surgical risk patients with aortic stenosis (PARTNER 1): a randomised controlled trial. Lancet. 2015;385(9986):2477–84. https://doi.org/10.1016/S0140-6736(15)60308-7.